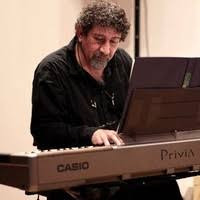 PAUL ARSLANIAN started his professional career as a pianist, composer for dance and theater, and dance accompanist in San Francisco during the 1970s where he led his own jazz and Latin ensembles and was composer and pianist for the Bishop Norman Williams Quartet. He has recorded with such notables as Pepper Adams, Pharaoh Sanders, Dave Liebman, Woody Shaw, and Bill Summers, and been a sideman with Freddy Hubbard, and Terri Gibbs. In 1979, Paul co-founded the Jazz Tap Ensemble and as music director worked with tap dancing greats Honi Coles, Foster Johnson, Cookie Cook, Eddie Brown, Harold and Fayard Nicholas, Buster Brown and many others. Since relocating to the East in 1984, Paul was pianist for the Archie Shepp Quartet for two years, released his own recording entitled It's the Feeling That Counts, and toured extensively throughout the U.S. and Europe as music director for numerous productions, including Dance Umbrella’s Fascinating Rhythms tour which featured Savion Glover, Jimmy Slyde, and Gregory Hines and drummer Alan Dawson. Paul’s jazz compositions have been recorded by George Coleman, John Hicks, Roy Hargrove, René Roznes and Bertha Hope. Paul recently served as music director for a two week long tap dance intensive at Jacob's Pillow Summer Dance Festival in both 2010 and 2012. Paul continues to work as a freelance jazz pianist, is a Senior Lecturer in dance and accompanist for the dance department at the University of Massachusetts, Amherst and has been pianist and coordinator for the weekly Northampton Jazz Workshop series since 2010. All About Jazz musician pages are maintained by musicians, publicists and trusted members like you. Interested? Tell us why you would like to improve the Paul Arslanian musician page.